PS - New Glarus Brewing Co is an awesome craft brewery in (surprise) New Glarus, WI that has super tasty beers. It's on our wish list to go there for a brewery tour and stay in a swiss chalet, since New Glarus is the 'Little Switzerland' of Wisconsin. How fun is that? 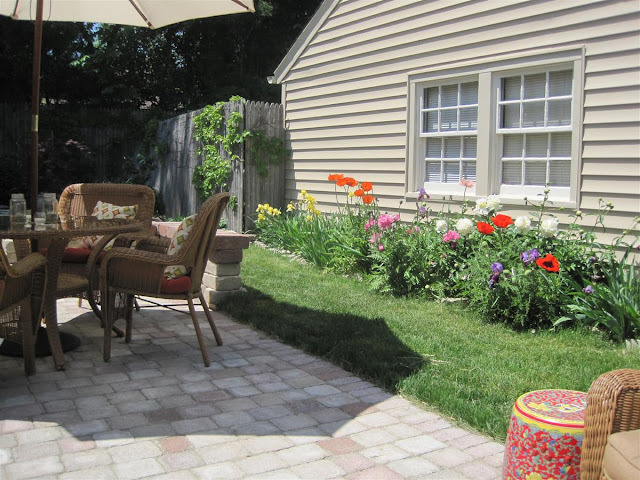 Not only is the patio a welcome and private place to relax, but our amazing neighbor Margo planted all kinds of eye-candy alongside their garage long before we moved here. We don't have to do anything but enjoy this rainbow of perennials! The view doesn't get much better than this when you're sitting out here with a cold beer. 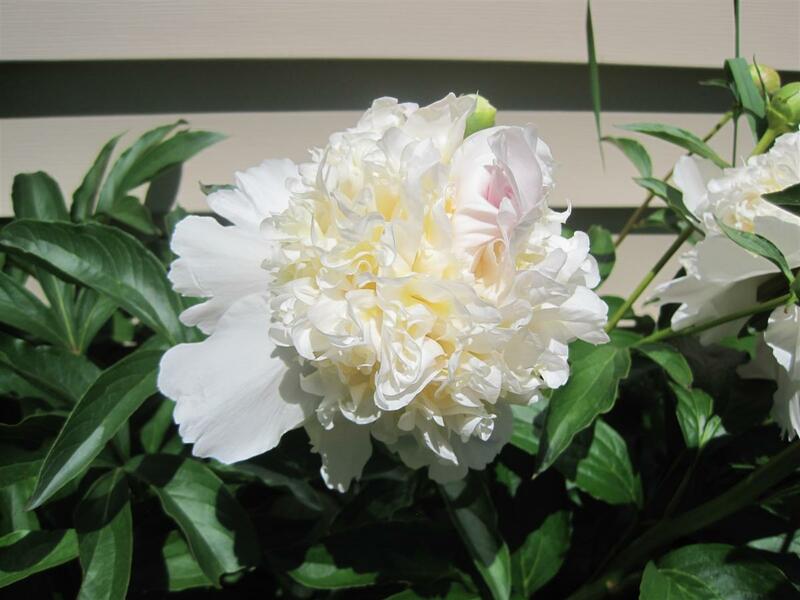 And the peonies certainly don't disappoint, she has pink and white ones to ogle and sniff. Shaun couldn't help but snip a couple for a little arrangement. Dude loves pretty flowers. 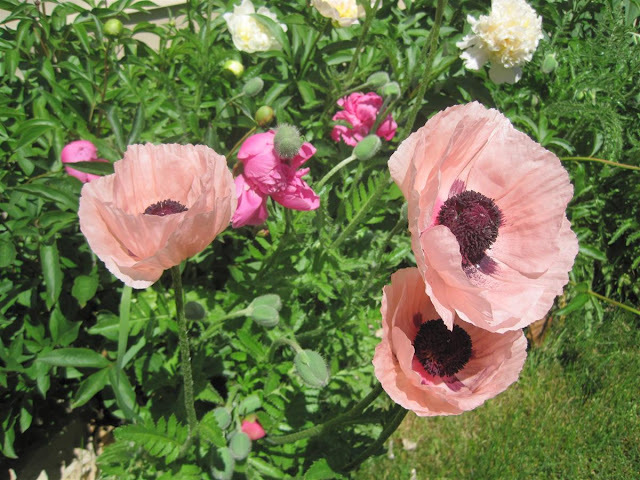 I love poppies and peonies. I don't have either in my yard yet, but I will in the next house, for shizzle. What a pretty view. Love good neighbors. And, alcohol on the patio. Mmmm...Spotted Cow! We love it so much we had free Spotted Cow at our wedding. They have Swiss chalets there? Hmm it's a tiny, tiny town with not much there besides the brewery and a bridal shop. I'm sure the brewery would be a good time though! Before I got to the end of the post I was already thinking, wonder if they ever cut a few for themselves? I totally would, they're gorgeous! You're patio look just fabulous! The patio looks great!! There's nothing like a beer out on the patio in summer! Wow, that looks like the perfect place to hang out every single night this summer. And those poppies are GORGEOUS!! I really want to add some to our yard. The patio is gorgeous, as are the flowers! You are lucky to have a gardening neighbor! I love New Glarus!! The Coffee Stout is my alltime fav. I actually have driven to Wisconsin just to get it. Not kidding. I love outdoor louging! It's worth all the hard work. Your patio looks great, and those flowers are amazing! What a nice neighbor!!! Ha, all my neighbors grow are weeds and dirt! Looks good ... nice neighbours. I love summer and sitting outside enjoying the view. Love to see you enjoying your space. Beautiful! And how nice of your neighbor to plant all those for you to enjoy, too. :) Aren't patios the greatest? Can your neighbor talk to my neighbor please?! The patio looks great! Is that an Ikea vase? 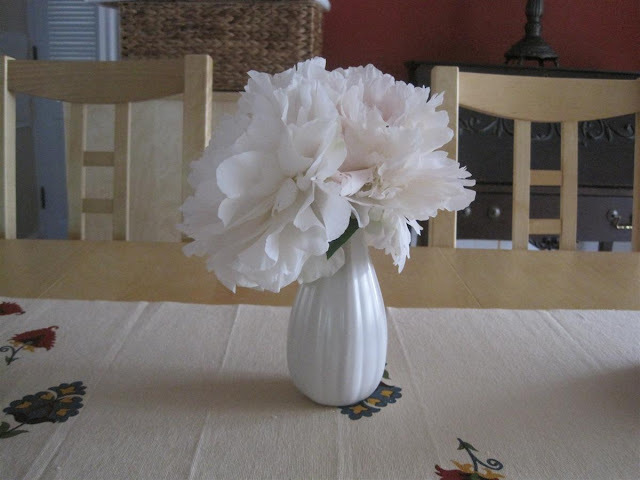 I have three similar ones from there that come out in summer for the exact same reason- to hold cuttings. Enjoy yourselves! Uff-Da... :) Have you toured the brewery? As a homebrewer myself... I was uber-impressed with their operation... copper brew kettles salvaged from Germany. Looks fabulous! Wish we were neighbors - I'd come join you and bring the beer. Gorgeous flowers!!! They don't even look real, they're so pretty. Andrew is a huge beer guy so I surprised him with a private tour at a local brewery in January. He LOVED it. Such a fun thing to do. That patio looks like the perfect place to relax after a long day, while sipping a cocktail and talking...and I'm pretty sure it will get a lot of use this summer :) It's lovely. I want your life. 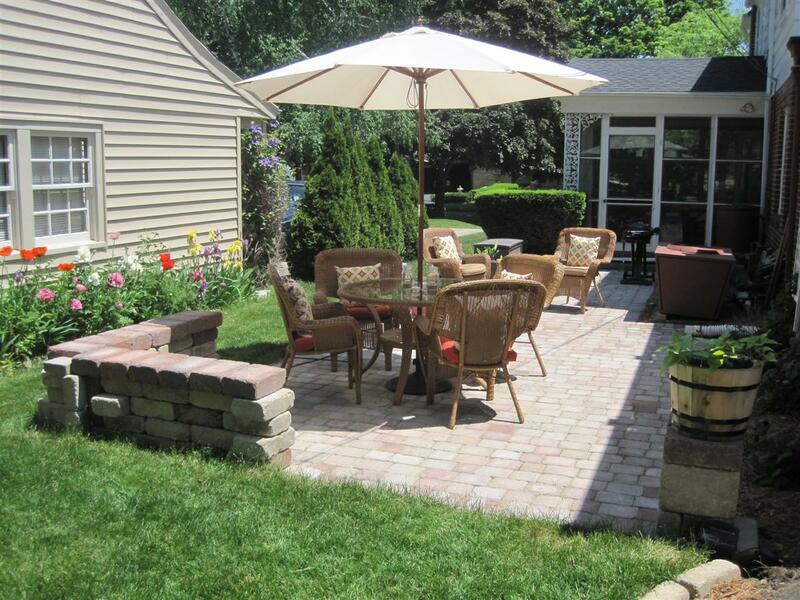 More specifically, I want your patio. Sweet! Threeacres - the Chalet Landhaus was what I was referring to - so quaint! 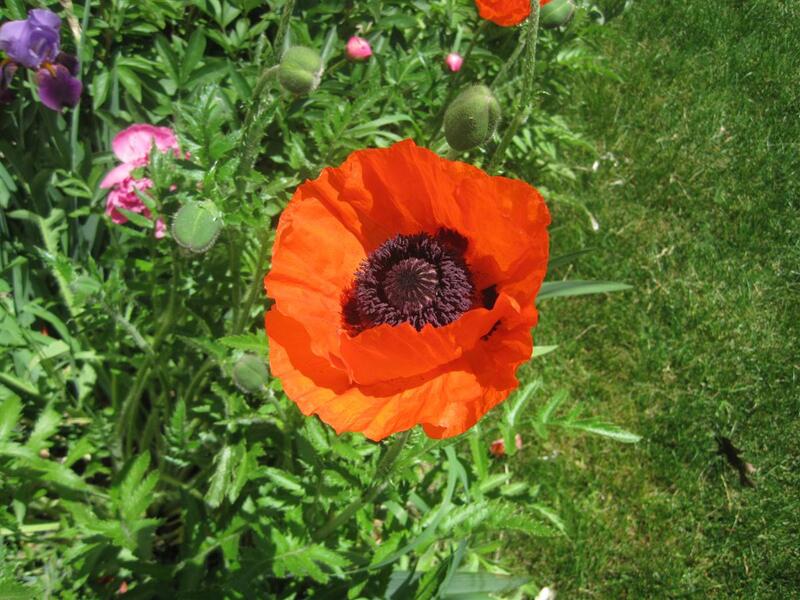 We have to admire our neighbor's flowers too b/c we have none. I wish we were one of the lucky ones for whom the previous owner left an English garden for us to enjoy. The patio looks fabulous, but what I'm really admiring is the New Glarus. Oh, how I miss their wonderful beer! 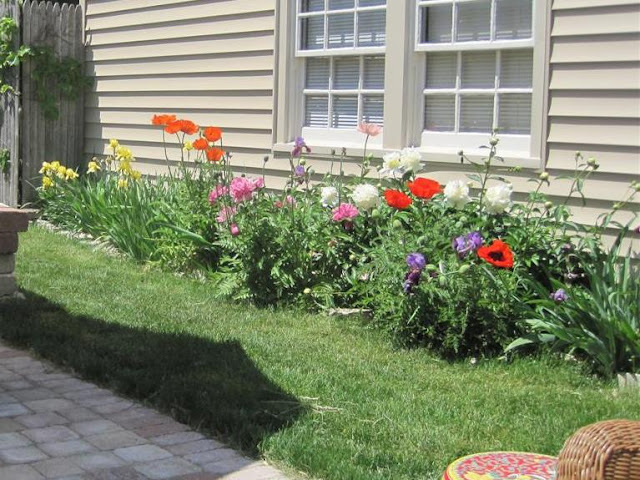 Your patio looks wonderful --totally not DIY-- and those flowers are gorgeous. I need such neighbors.